2:16 p.m., Feb. 21, 2011----Guang Gao and a team of researchers at the University of Delaware are performing ground-breaking research that may impact the landscape of supercomputing. Again. Gao, Distinguished Professor of Electrical and Computer Engineering, is working to improve the speed, efficiency and computational capacity of the nation's extreme-scale supercomputer systems. This effort is part of a research and development initiative by the Defense Advanced Research Projects Agency (DARPA) to create an innovative, revolutionary new generation of computing systems under DARPA's recently announced Ubiquitous High Performance Computing (UHPC) program. Gao and the University of Delaware are members of the Intel Corporation UHPC team. According to DARPA, the research arm of the U.S. Department of Defense, advanced computing is critically important to national security. The UHPC program plans to advance radically new extreme-scale computer architectures and programming models that deliver 100 to 1,000 times more performance, and that are easier to program than current systems. Prototype UHPC systems are expected to be complete by 2018. Gao and his team at the Computer Architecture and Parallel Systems Laboratory (CAPSL), located in the Department of Electrical and Computer Engineering at UD, are part of the Intel-led UHPC team focused on prototyping revolutionary hardware and software technologies for extreme-scale computing systems. The UD team is leading the fundamental computer system research on execution models and its impact on system (software) design. They will work in close collaboration with other principal members of the Intel team from University of Illinois at Urbana Champaign, University of California at San Diego, Reservoir Labs Inc. and E.T. International, Inc. (ETI). “This is a very important event for the nation. This project will develop a supercomputer that puts the United States ahead of our competitors. But with that comes a lot of responsibility,” says Gao, an expert in computer architecture and parallel systems. Parallel computing is an important technology employed by supercomputer architectures to use multiple processors (CPUs) to speed up the execution of application programs. Computing performance increases have historically been driven by Moore's Law, which states that “the number of transistors that can be placed on an integrated circuit doubles every two years.” Current models have limitations, however, and achieving projected performance gains requires new thinking. “Professor Gao's involvement in the DARPA ubiquitous high performance computing project demonstrates his leadership in the extreme computing realm. The outstanding collaborative team comprised of Intel and leading universities are certain to ensure that the project outcomes significantly impact the future of high-performance computing for many years,” says Kenneth Barner, chair of the Department of Electrical and Computer Engineering. 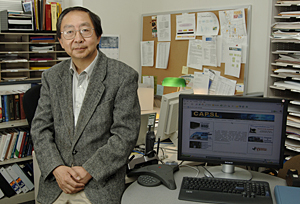 A consummate researcher and educator, Gao's pioneering work on novel computer architecture models and system software, including the compilers that optimize applications for efficient execution, serves as the basis for high-performance parallel supercomputers and is considered to be at the pinnacle in processing capacity, particularly in speed of calculation. He has led numerous research programs in parallel computing architecture and software sponsored by the National Science Foundation, Defense Advanced Research Projects Agency (DARPA), Department of Energy, Department of Defense, and other U.S. and Canadian government agencies and private organizations. ETI, founded by Gao and his associates as a UD start-up and now a partner of the Office of Economic Innovation and Partnerships, is a computer technology and software company. ETI specializes in developing and deploying system software solutions and tools for advanced computing architectures and platforms based on new multi-core chip technology. ETI's system software explores large-scale many-core chip technology, with 160 processing cores on a single chip designed by IBM, to power the world's most influential supercomputer systems based on many-core technology. “We have received tremendous support from our department, college and University administration. Such support brings tremendous inspirations and encouragement to the members of the team in their pursuit of excellence,” says Gao.